Arnold is responsible for Xerox’s Global Business Innovation Partner and Developer programs. The programs are the focal point to enable vendors and software developers from all over the world to access Xerox resources (business & technical) to collaborate for new innovative services and solutions. Arnold has more than 29 years in engineering, strategy development, and management. He began a very exciting career when he joined Xerox in 1985 as a summer intern from UCLA. Arnold began his full-time career with Xerox Corporation as an Electronic Engineer in the El Segundo, California Electronics Division in 1987. He spent several years in Xerox Innovation Group organization where he focused in the areas of color science and image processing. In 2005 he accepted an assignment to support global Xerox initiatives which resulted in him becoming a Lean Six Sigma Black Belt. In 2007, Arnold joined the Workflow Business Unit senior staff as the Fuji-Xerox Technical Interface Manager. His responsibility was managing technology exchanges between Xerox and Fuji-Film’s joint venture Fuji-Xerox. 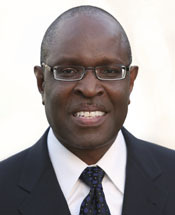 Arnold became Vice President of Alliance and Partnership Management in April 2008. Arnold serves on several non-profit boards including UC Irvine Henry Samueli School of Engineering Diversity Board, UCLA Henry Samueli School of Engineering Center for Excellence in Engineering and Diversity, UNCF-Los Angeles Leadership Council, USC Viterbi School of Engineering Center for Engineering Diversity, USC Viterbi School of Engineering Corporate Advisory, CSULB School of Engineering Corporate Advisory Council, and The Wiley Center for Speech and Language Development. Arnold holds a BS from UCLA, a MS in Computer Science from CSULB, and an Executive MBA from USC. Arnold’s true passion is serving the community as a volunteer, mentoring for students in STEM and spending time with his family and friends.